All Things Katy! : Sponsored Post- #SayFreezewithKidfresh KidFresh and a GIVEAWAY!! Sponsored Post- #SayFreezewithKidfresh KidFresh and a GIVEAWAY!! **Disclaimer-I received this product for free from the manufacturer. I agreed to use this product and post my opinion on my blog. My opinions do not necessarily reflect the opinions of the manufacturer of the product. Hello and Happy Frozen Foods Month!! That's right- who knew that frozen foods got their very own month?! I know that I certainly didn't! Anyway, I'm here to share a fun, healthy and kid-friendly product with you AND a giveaway!! So, let's get started and let me introduce you to KidFresh- Healthy Frozen Kid's Meals. KidFresh- Healthy Frozen Kid's Meals started as an idea and evolved into a whole line of healthy frozen kid's meals. Founder, Matt Cohen has the following to say about the beginning and evolution of KidFresh- Healthy Frozen Kid's Meals, "Kids’ meals these days… a lot of them are downright scary and often loaded with all sorts of artificial ingredients. As a father myself, I decided that we needed more options for all-natural kids’ meals – the kind that are yummy and nutritious for children while convenient for parents." "We did just that, in a real kitchen, with the help of a top chef and a pediatric nutritionist. We first started with our own concept store in New York City where we offered natural and organic kids foods, including our own, freshly prepared in our kitchen. We loved feeding moms and kids everyday and the Kidfresh store attracted a lot of media interest from all around the world, some of it presented here." Rich of this innovative and unique experience, we decided to broaden our reach and offer our all natural kids meals in supermarkets throughout the country. The result is our new line of frozen Kidfresh meals: a twist on children’s favorite foods, rich in vegetables and without a single drop of anything artificial. Even our packaging meets the highest safety standards with no BPA, no Phthalates nor other potentially harmful chemicals. We use recycled paper, carbon-neutral printing and recyclable containers." "While this is all well and good, the most important thing is that our meals taste great and children love them. It is our passion and we hope you’ll enjoy our meals!" I was provided with six vouchers to try out KidFresh- Healthy Frozen Kid's Meals. I was able to easily locate KidFresh- Healthy Frozen Kid's Meals at our local Super Target and Harris Teeter grocery stores. Now, Lil' Miss is a carnivore, so I thought that I'd try out the KidFresh meat options, first. I chose the Super Duper Chicken Nuggets, the Mighty Meaty Chicken Meatballs and the Fun-tastic Fish Sticks. Tonight's dinner was tortellini, so I thought that the Mighty Meaty Chicken meatballs would fit right into the menu. Lil' Miss was a willing sidekick in the kitchen. Since the meatballs are already fully cooked, I just had Lil' Miss pour the meatballs right into the sauce and cook. KidFresh- Healthy Frozen Kid's Meals- Lil' Chef! I'm luckier than most- my daughter is a fairly good eater (eater, yes, sleeper, no!). Anywho, I've been trying to make a concerted effort to include more fresh fruits and veggies into our daily diets. While Katy loves her meats, dairy and carbohydrates, she is not a big fan of vegetables. So, I do feel that is one area that we are lacking in. So, when I saw that KidFresh- Healthy Frozen Kid's Meals included vegetables, I was willing to give it a go! Now, let's talk nutrition. I took a picture of the side of the Mighty Meaty Chicken Meatballs just so I could observe the ingredients better. As you can see, there are vegetables (carrots, onions) listed in the list of ingredients. Also, six meatballs make up a serving of 150 calories. That's pretty reasonable compared to the over 180 calories found in just three turkey meatballs of another brand of frozen meatballs. Not too shabby...! Dinner was easy to prepare and the Mighty Meaty Chicken Meatballs took just minutes to warm through. When Katy sat down to eat, she was excited to try out the kid-marketed KidFresh Mightly Meaty Chicken Meatballs. And, I'm happy to report that she ate ALL of her dinner- salad, and meatballs included!! Yum!! When I asked Lil' Miss what she liked about the meatballs, best, she told me, "All of it!!" Personally (because, I had to try them, too! ;-), I found the meatballs to be moist, flavorful and easy to chew. No funny bits of gristle or anything unidentifiable floating around. Overall, I'd say that KidFresh- Healthy Frozen Kid's Meals were a success!! Tasty, healthy and completely finished! 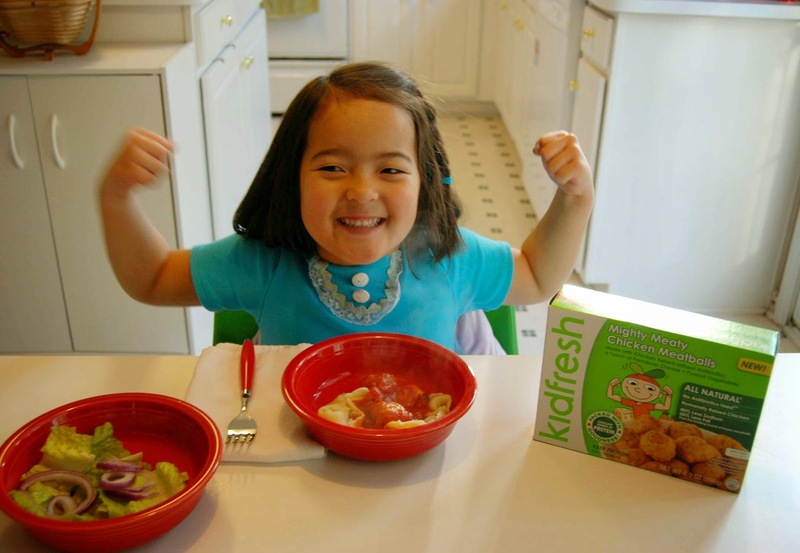 KidFresh- Healthy Frozen Kid's Meals- A winner of a dinner! Okay, now for the fun part- the GIVEAWAY!!! 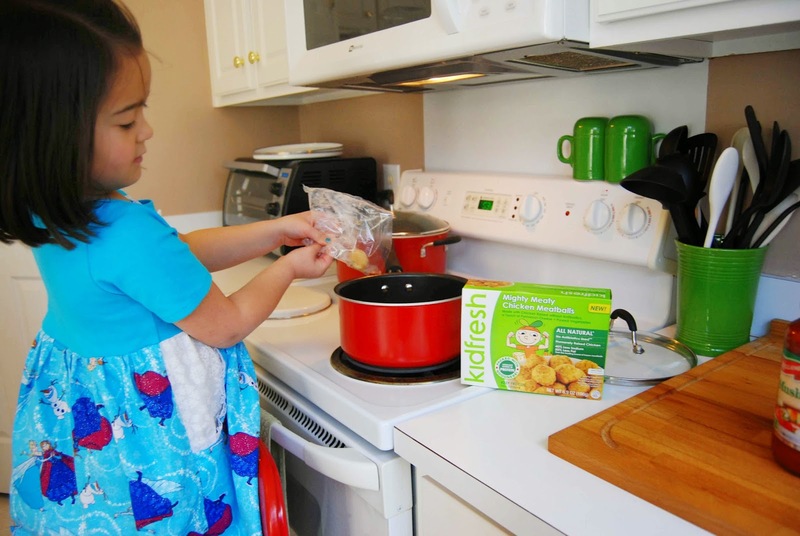 Would you like to try KidFresh- Healthy Frozen Kid's Meals with your family? KidFresh has graciously agreed to give one lucky winner of All Things Katy! 10 coupons for KidFresh meals! How cool is that?! Your kids will like the fun, kid-friendly meals and you will love the healthy, humanely-raised animals and socially responsible mindset of KidFresh. The giveaways will start at midnight on Tuesday, March 10 and end at midnight on Tuesday, March 24, 2015. Winner will be chosen at random using Rafflecopter. I do need an email in which to contact the winner. The winner will then need to provide me with name, email and mailing address. Now, go ahead and enter, below!!! Happy, Healthy Frozen Food Month!! The burritos! Joey loves to have things like that for breakfast! 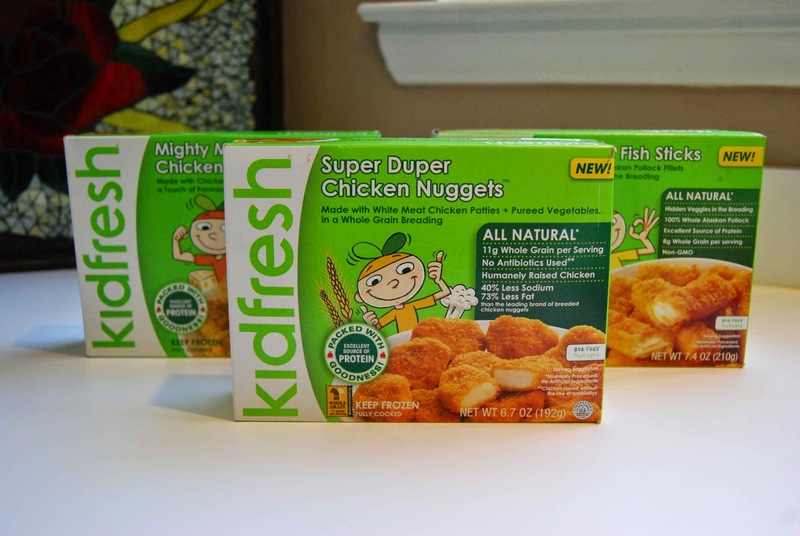 We want to try the Kidfresh Super Duper Chicken Nuggets!